This is the simplest of all models in that the dispersion component of the base data - the peak intensity values - is not modelled. It is used to determine either the R2eff or R1ρ values and errors as required for the base data for all other models. It can be selected by setting the model to `R2eff'. Depending on the experiment type, this model will be handled differently. The R2eff/ R1ρ values determined can be later copied to the data pipes of the other dispersion models using the appropriate user functions. This is not implemented in relax as it can be shown by simple simulation that the formula is incorrect (see Figure 11.1). This formula significantly underestimates the real errors. The use of the same I0 value for all dispersion points does not cause a decrease in the R2eff error but rather a correlation in the errors. Figure 11.1: A demonstration of the inaccuracy of the error formula of Equation 11.12 from Ishima and Torchia (2005). This plot was generated using the script test_suite/shared_data/dispersion/error_testing/simulation.py. 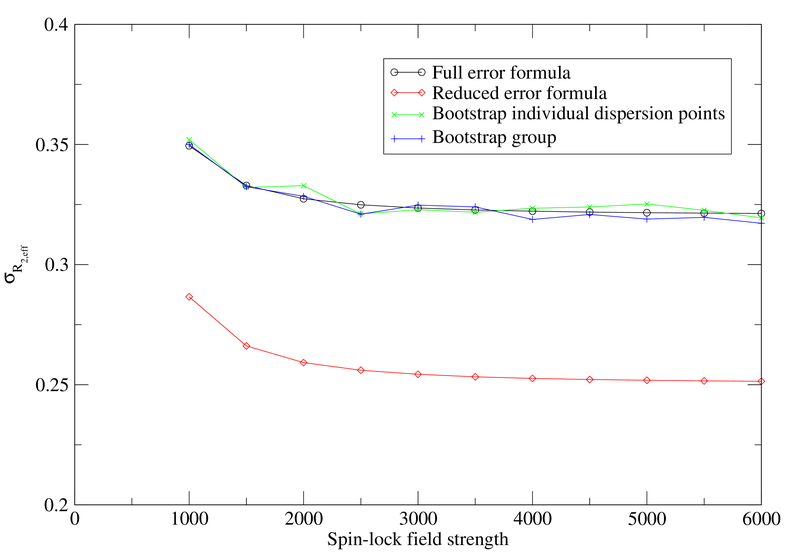 The bootstrapping simulation involves randomising noise-free I0 and I1 values for each dispersion data point assuming Gaussian errors. The full error formula is from Equation 11.4, the reduced error formula is from Equation 11.12, the bootstrapping using individual dispersion points estimates the errors assuming different I0 randomisations for each dispersion point and each simulation, and the bootstrapping group graph uses the same randomised I0 value for all dispersion points for each simulation. For the variable relaxation time period type experiments, the R2eff/ R1ρ values are determined by fitting to the simple two parameter exponential as in a R1 or R2 analysis. Both R2eff/ R1ρ and the initial peak intensity I0 are optimised using the minimise user function for each exponential curve separately. Monte Carlo simulations are used to obtain the parameter errors. the relaxation dispersion page of the relax website at http://www.nmr-relax.com/analyses/relaxation_dispersion.html#R2eff.